Email info@musicalfutures.org if you are interested in a Just Find Your Voice workshop or would like to host at your school/organisation. 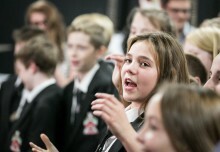 Musical Futures: JustFind Your Voice is a practical, hands-on, inclusive approach for engaging students of all ages with singing through vocal work and the integration of mobile technology. 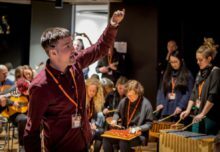 The approach looks at a range of teaching and learning strategies to engage all students with singing in the classroom and to help them feel confident about using their voices and mobile technology to create and explore music. Just Find Your Voice developed in response to the 2012 Music in Schools: Wider Still and Wider report that highlighted the scarcity of good vocal work in secondary schools, where nearly half of those inspected were judged inadequate for singing, and the underuse of music technology across all levels were found to be significant barriers to musical progress. Integrated with the Just Find Your Voice approach and training is the exploration of the use of mobile phones and tablets as tools for enhancing, extending and creating music. This use of technology has been powerful in demonstrating to teachers and students that mobile devices can be powerful instruments in their own right. 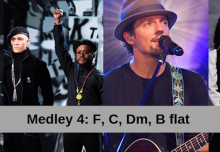 Christmas songs that fit with the Find Your Voice 4 chord mash up task.